Current Ramblings . 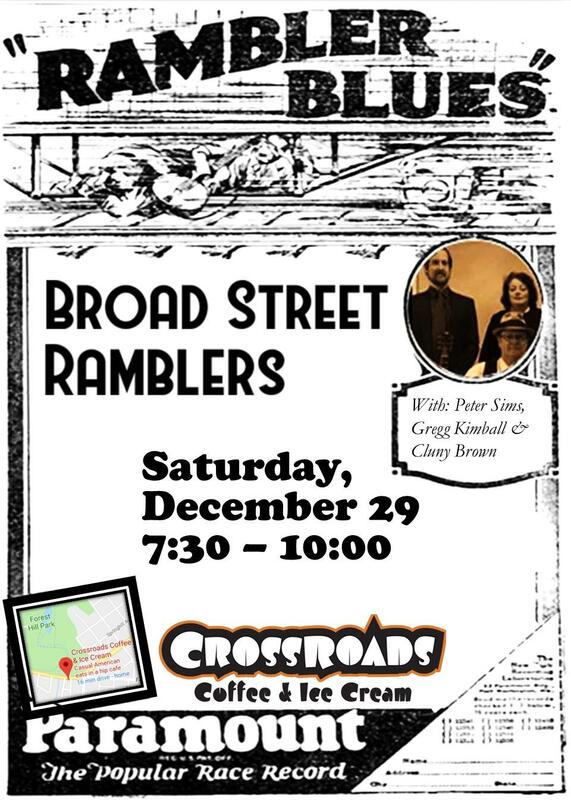 . .
Crossroads welcomes the Ramblers back for a night of traditional tunes on Dec. 29, 2018. Musical conversation with the exhibition Monument at the Institute for Contemporary Art, Richmond, Feb. 22 and 23, 2019. "Down on the Farm: Songs of Land, Labor, and Nature," multimedia presentation at the Varina Library, Thursday, March 21st, 7:00 pm. The Broad Street Ramblers are veteran Virginia musicians steeped in a wide range of traditional musical styles. A typical set list roams from string band tunes to rural blues to Celtic jigs and hornpipes. This tasty stew of traditional music even includes Hawaiian numbers, a Ramblers specialty. The band has played major festivals and intimate coffeehouse settings; because of their deep knowledge of traditional music they also offer interpretive programs. The Ramblers' play as both a trio and quartet and includes Gregg Kimball (guitar, steel guitar, fiddle, banjo, and melodeon), Ron Curry (guitar, banjo, ukulele, autoharp), Cluny Brown (vocals and percussion), and Peter Sims (guitar and ukulele). Take a break between the holidays to join us at Crossroads on December 29 for a night of traditional tunes. On February 22nd and 23rd, we'll be doing two performances in musical conversation with the Rashid Johnson's exhibition Monument as part of the Institute for Contemporary Art's "Provocations" series.